Quartz vs Granite – Which Is Best for Kitchen Counters? The quartz vs granite debate has been around for ages. Both materials have their perks. Here are some things to consider before choosing one for your kitchen. Are you remodeling your kitchen and having trouble deciding on countertop material? The quartz vs granite countertop debate has been a popular one lately and many homeowners are asking themselves, is there even a difference? Granite and quartz each have their own unique look and are worth examining separately. We’ve broken down their differences below so you can make an educated decision when selecting your next countertop. Quartz is made by combining crushed rock with resin. It is just as strong as granite but typically easier to install because of the cut and variety of shapes you can create. Quartz is heavier than granite so be sure to hire a professional to install your kitchen countertops. It will likely take two people. Quartz is a low maintenance material and requires no sealing when installed. It will not absorb anything that is spilled on its surface and is a stain resistant choice. While it’s not an indestructible material, it is extremely durable and can withstand heat, cold, spills and typical wear and tear without compromising its look. It’s important to note that the color of your quartz countertop can fade if exposed to long periods of sunlight. If part of your countertop is going to be near a window, this should be a consideration as that area will likely decrease in color over time. Granite comes straight from the earth as is. This means the buyer has to be flexible when it comes to the pattern and color of the granite as it cannot be altered. There will be imperfections, which is part of its appeal as it has a natural, organic feel to it. Granite must be sealed. If it’s not, it will absorb any substance that is spilled or placed on the countertop. If it’s sealed correctly and maintained yearly, the countertop will be stain and spill resistant. Granite is more heat resistant than Quartz–you can place pans directly on its surface (though I still don’t recommend this in any way!) where Quartz you couldn’t do that. However, if the seal is not maintained, the granite will become susceptible to anything that is placed on it. 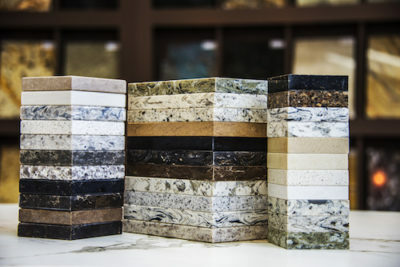 The countertop is extremely durable, however, because it is a naturally occurring stone that is of the earth, it can be chipped or damaged if it’s mistreated. If the granite is properly cared for and only exposed to normal wear and tear, you can expect a lifetime guarantee. Granite and quartz are surprisingly similarly priced, which may be why homeowners find themselves going to the quartz vs granite debate over and over again. There is no ‘average cost’ to installing granite or quartz. It depends on layout (seams), polished edges, how many cut outs (which is dependent on appliances and sinks) and overhangs. It is always best to get a quote. Quartz has the tendency to have a higher price point in some instances because of its durability and the fact that it does not require a seal. Quartz has exploded on the scene in recent years because of its ability to accomplish the aesthetic of granite but with more options and material durability. When selecting quartz, you will have the ability to customize your countertop. You can select the exact color or pattern of your choice because a manufacturer is creating the material. When selecting granite, you can’t be as picky. Because the material is sourced from the earth, you’ll never be able to tailor the look in a specific way. You’ll simply have to find a slab that suits your taste and learn to love all its occlusions and imperfections. The upside of a granite countertop is that no two pieces will be exactly the same. This means your countertop is unique and exclusive to your home only. Quartz vs Granite: Which Will You Choose? Now that you’re fully up to speed on quartz vs granite, you’re ready to select the material that suits your needs and your aesthetic. Contact us with any questions or for help on your next remodel and be sure to check out our portfolio for design inspiration.